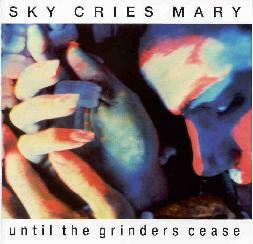 Sky Cries Mary - "Until the Grinders Cease"
Seattle's avant space combo Sky Cries Mary didn't start out as you might have guessed. The band was founded in the late 1980s by vocalist/lyricist Roderick Romero and the pair of multi-talented musicians (Jon Auer and Ken Stringfellow) who soon split to form the Posies. Their 'Dear 23' album displayed fine songwriting, a kind of quirky modern exploration of Beatles' songs. The Posies have since disbanded, the two now working on various solo projects and with The Minus Five. Of course, Roderick went on to recruit new members for SCM, including artist/vocalist/wife Anisa, evolving quickly into the outstanding space-rock orchestra we now know. The re-release of the rare first LP 'Until the Grinders Cease' (recorded before the initial split) shows how different they were back then. These eight tracks (totalling only 32 minutes) are actually industrial music, aggressive without necessarily being too loud, but certainly not ethereal or dreamy. The album starts with "Propergenda," simply a drum beat and lone synthetic tone as backdrop for a mix of ranting and screaming. No idea what they're going on about here.... I'm sure it was important to them at the time. "Shakespeare Factory" is one of the more abrasive tracks, with non-stop cymbal crashing and agonized vocals, though I'm sure this stuff is tame compared to what's out there in hard-core industrial music. "When the Fear Stops" is the only track that is familiar SCM material, but that's because this one was remade for the 'A Return to the Inner Experience' album. Here, it's just a vocal duet and percussion...still works, but I prefer the full band version. "Desert Song" is rather interesting, initially a poetry reading by Roderick over a programmed electronic rhythm, but then a wild, noisy outburst takes over. However, the bulk of the album is regimented beat-driven material and/or other peculiar sound experiments, without much development in song structure or the layering of instruments. I don't see any reason to track this down unless you're a completist or something. You can visit Sky Cries Mary at their web site. SCM's Anisa Romero has recently joined up with ambient artist Jeff Greinke to produce the 'Hana' CD, and have continued their partnership in a live setting opening for the parent group in recent months. Greinke (a fellow Penn State alum transplanted to Seattle) has been prolific since the early 1980's, both as a solo artist and fronting his group Land. Of the eight tracks presented, only two are written with lyrics though Romero contributes various 'vocal explorations' on the others. SCM's Ben Ireland also assists on percussion on four tracks and Juano Davison plays bass pedals on "Above the Head." "Smoke" is the better of the two 'lyrical' tracks, with each line lapping over Greinke's warm fuzzy sounds like successive waves upon a beach. "Wash Me By" is a little disappointing as I was hoping to hear Anisa sing on her own for a change, and of course she simply sings the same duet style with herself! The song is very reminiscent of some of the better SCM tunes, and would've worked with the full band. But I've got larger problems with the so-called 'manipulations' of Anisa's vocals on "Lizard Opera." I found the effect quite bothersome, in that the coloratura soundbites repeating over and over just sounded really squirrely after a while. "Sweet Sorrow" has a similar effect... there's only so much 'lamenting' I can take. And there's not enough real music to thin it out. I really expected to like 'Hana' a lot, but found that there really isn't enough going on to hold my interest. And while Anisa has tremendous abilities (best witnessed live alongside Roderick in SCM), I would have preferred a less 'artistic' approach here. It's not just that her voice is really expressive and dramatic (dangerous territory from my perspective), here I simply see a limitation in singing just 'ambient' sounds. 'Space whisper' works best when mixed with a second vocalist I feel. Anyway, both of these albums show that the members of SCM have a variety of musical interests (always a healthy thing), but to the average spacerock fan I'd imagine that the new 'Seeds' EP would be a much stronger bet (watch next issue for a review). One thought I had... perhaps listening to 'UtGC' and 'Hana' simultaneously might work? It would seem that each has about half of the right idea. For more information on Hana, contact First World, P.O. Box 30932, Seattle WA 98103.